The last Razr was impossibly thin. The new Motorola Razr Maxx isn’t. So why buy it? The Motorola Razr Maxx is all about battery life. Now we use our phones so much, they run out of steam. Has Moto solved the problem? 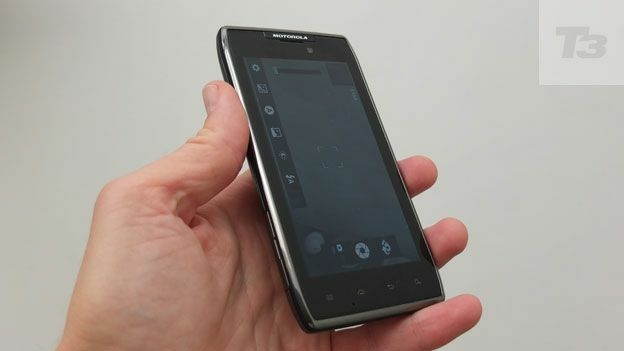 Look at it from the front and the Motorola RAZR Maxx looks quite like last year's model - the Motorola Razr. Turn it sideways and you'll see it's put on some weight. It's not like it's, you know, fat. There are chunkier handsets out there, like the Nokia Lumia 900 and the Sony Xperia S. But it's no longer catwalk thin. Still, since every extra millimetre contains added battery, you may be grateful. Like the slimmer Razr, this is a solid build, with no creaking. Not least that's because the battery is sealed in, so there's no removable back. The back is covered in Kevlar because it's tough (and just sounds so cool). The curved corners also look good and the sloping back, though a gentler incline than last time, feels good in the hand. Battery aside, this is very nearly identical to the last Razr, so it has Motorola's MotoCast, which lets you play back music from your computer on your phone, wherever you are. And Smart Actions mean you can programme the handset to automatically switch to silent when your calendar says you're in a meeting, say. The display is identical to last year's model but since that was pretty darn good, you won't be complaining. It's a sharp, vivid Super AMOLED model with a resolution of 256 pixels per inch. Not Retina Display like on the Apple iPhone 4S, then, but very respectable and enough to make video look great – though the Razr Maxx has a mini HDMI out so you can play back content on the big screen, too. The processor in the Razr Maxx is last year's too, but it's a dual-core 1.2GHz model, so no slouch, but no match for the quad-core chip in the Samsung Galaxy S III. And the phone is due to be upgraded to the latest Android software, Ice Cream Sandwich, in the next few weeks, so it will have all the latest extras then. The 8MP camera was unexceptional, with image quality suffering in low light. This is the killer function on this phone. Instead of conking out at lunchtime the Razr Maxx goes on. And on. For days. It makes you think it's an old-school Nokia. The Samsung Galaxy Note has a big battery and lasts a long time, but this beats it hands down. On some phones even very light use depletes the battery in a day, but not this one. Really, it's remarkable. The Motorola Razr Maxx has great stamina so you won't be anxious if you forgot to charge it overnight. It goes for days. The casing is thicker than last year's Razr but not uncomfortably so, thanks to clever design and Motorola's curved corners design language. The high-resolution display continues to dazzle, and the phone's connectivity with a mini HDMI socket are helpful extras. It may not have a quad-core processor but this phone rarely dawdles. The camera is unexceptional, but enough for those Facebook snaps. Moto's specialities like MotoCast to play your PC's music on your phone, and configurable extra commands add to the Android fun. When it's upgraded to Ice Cream Sandwich, this will be an even more compelling phone.